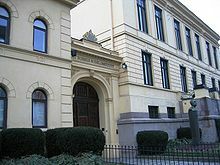 Institut Nobel Norwégia (The Norwegian Nobel Institute) mbiyantu Komité Nobel Norwégia (the Norwegian Nobel Committee) sajeroning nyelèksi calon panampa lan nyiapaké acara taunan penganugerahan Nobel ing Oslo. Bebungah Nobel Bedhamèn iku sawijining bebungah sing dianugerahaké saben taun déning Komité Nobel Norwégia "marang sadéngah wong sing wis ndarmabhaktèkaké karya paling apiké tumrap paseduluran antara bangsa-bangsa, kanggo ngilangaké utawa ngurangi kabutuhan wadyabala lan kanggo njaga lan promosi upaya damai." 1901 Frédéric Passy Prancis "[for] being one of the main founders of the Inter-Parliamentary Union and also the main organizer of the first Universal Peace Congress." Jean Henry Dunant Swiss "[for] his role in founding the International Committee of the Red Cross"
1902 Élie Ducommun Swiss "Honorary Secretary, Permanent International Peace Bureau"
Charles Albert Gobat Swiss "Secretary General, Inter-Parliamentary Union; Honorary Secretary, Permanent International Peace Bureau"
1903 William Randal Cremer United Kingdom "Member, British Parliament; Secretary, International Arbitration League"
1906 Theodore Roosevelt Amérika Sarékat "for his successful mediation to end the Russo-Japanese war and for his interest in arbitration, having provided the Hague arbitration court with its very first case"
1907 Ernesto Teodoro Moneta Italia "President, Lombard League of Peace," was "prominent as a worker for peace in Italy." Louis Renault Prancis "Professor International Law," was "the permanent delegate of Prancis to The Hague Tribunal." 1908 Klas Pontus Arnoldson Swedia "Founder of Swedish Peace and Arbitration League"
1909 Auguste Marie François Beernaert Bèlgi "ex-Prime Minister; Member, Belgian Parliament; Member of Cour Internationale d'Arbitrage"
Paul-Henri-Benjamin d'Estournelles de Constant Prancis "Member, French Parliament (Sénateur); Founder and President of French parliamentary group for voluntary arbitration; Founder, Committee for the Defense of National Interests and International Conciliation"
1910 International Peace Bureau Swiss "Founded in 1891"
1912 Elihu Root Amérika Sarékat "ex-Secretary of State; Originator of various treaties of arbitration"
1919 Woodrow Wilson Amérika Sarékat "President of Amérika Sarékat of America; Founder of the League of Nations"
1920 Léon Victor Auguste Bourgeois Prancis "ex-Secretary of State; President, French Parliament (Sénat); President, Council of the League of Nations"
1921 Hjalmar Branting Swedia "Prime Minister; Swedish Delegate, Council of the League of Nations"
Christian Lous Lange Nurwègen "Secretary General of the Inter-Parliamentary Union"
1922 Fridtjof Nansen Nurwègen "Scientist; Explorer; Norwegian Delegate, League of Nations; Originator of "Nansen passports""
1925 Austen Chamberlain United Kingdom "Foreign Secretary; Part-originator of Locarno Pact"
Charles Gates Dawes Amérika Sarékat "Vice-President of Amérika Sarékat of America; Chairman of Allied Reparation Commission (Originator of "Dawes Plan")"
1926 Aristide Briand Prancis "Foreign Minister; Part-originator of Locarno Pact and Briand-Kellogg Pact"
Gustav Stresemann Jerman "ex-Lord High Chancellor (Reichs-kanzler); Foreign Minister; Part-originator of Locarno Pact"
1927 Ferdinand Buisson Prancis "Formerly Professor, Sorbonne University, Paris; Founder and President, League for Human Rights"
Ludwig Quidde Jerman "Professor, Berlin University; Member, German Parliament; Participant of various peace conferences"
1929 Frank B. Kellogg Amérika Sarékat "ex-Secretary of State; Part-originator of Briand-Kellogg Pact"
1930 Lars Olof Jonathan (Nathan) Söderblom Swedia "Archbishop; Leader in the ecumenical movement"
1931 Jane Addams Amérika Sarékat "Sociologist; International President, Women's International League for Peace and Freedom"
Nicholas Murray Butler Amérika Sarékat "President, Columbia University; Promoter of Briand Kellogg Pact"
1933 Sir Norman Angell (Ralph Lane) United Kingdom "Writer; Member, Executive Committee of the League of Nations and of National Peace Council"
1934 Arthur Henderson United Kingdom "ex-Foreign Secretary; President, Disarmament Conference in 1932"
1935 Carl von Ossietzky Jerman "Journalist (die Weltbühne); Pacifist"
1936 Carlos Saavedra Lamas Argentina "Secretary of State; President, League of Nations; Mediator in a conflict between Paraguay and Bolivia"
1937 Cecil of Chelwood, Viscount (Lord Edgar Algernon Robert Gascoyne Cecil) United Kingdom "Writer, ex-Lord Privy Seal; Founder and President, International Peace Campaign"
1938 Nansen International Office For Refugees Swiss "An international relief organization, started by Fridtjof Nansen in 1921"
1945 Cordell Hull Amérika Sarékat "ex-Secretary of State; Prominent participant in the originating of the United Nations"
1946 Emily Greene Balch Amérika Sarékat "Formerly Professor of History and Sociology; Honorary International President, Women's International League for Peace and Freedom"
John Raleigh Mott Amérika Sarékat "Chairman, International Missionary Council; President, World Alliance of Young Men's Christian Associations"
1949 Lord (John) Boyd Orr of Brechin United Kingdom "Physician; Alimentary Politician; Prominent organizer and Director, General Food and Agricultural Organization; President, National Peace Council and World Union of Peace Organizations"
1950 Ralph Bunche Amérika Sarékat "Professor, Harvard University Cambridge, MA; Director, division of Trusteeship, U.N.; Acting Mediator in Palestine, 1948"
1951 Léon Jouhaux Prancis "President of the International Committee of the European Council, vice president of the International Confederation of Free Trade Unions, vice president of the World Federation of Trade Unions, member of the ILO Council, delegate to the United Nations"
1952 Albert Schweitzer Prancis "Missionary surgeon; Founder of Lambaréné (République de Gabon)"
1953 George Catlett Marshall Amérika Sarékat "General President American Red Cross; ex-Secretary of State and of Defense; Delegate U.N.; Originator of "Marshall Plan""
1954 United Nations High Commissioner for Refugees Swiss "An international relief organization founded by the U.N. in 1951"
1957 Lester Bowles Pearson Kanada "former Secretary of State for External Affairs of Canada; former President of the 7th Session of the United Nations General Assembly"; "for his role in trying to end the Suez conflict and to solve the Middle East question through the United Nations." 1958 Georges Pire Bèlgi "Father of the Dominican Order; Leader of the relief organization for refugees "L'Europe du Coeur au Service du Monde""
1959 Philip J. Noel-Baker United Kingdom "Member of Parliament; lifelong ardent worker for international peace and co-operation"
1960 Albert Lutuli Afrika Kidul "President of the African National Congress," "was in the very forefront of the struggle against apartheid in South Africa." 1961 Dag Hjalmar Agne Carl Hammarskjöld Sweden "Secretary General of the U.N.," awarded "for strengthening the organization." 1962 Linus Carl Pauling Amérika Sarékat "for his campaign against nuclear weapons testing"
1964 Martin Luther King, Jr. Amérika Sarékat "Leader of "Southern Christian Leadership Conference""
1968 René Cassin Prancis "President of the European Court for Human Rights"
1970 Norman E. Borlaug Amérika Sarékat "International Maize and Wheat Improvement Center;" "for his contributions to the "green revolution" that was having such an impact on food production particularly in Asia and in Latin America." 1971 Willy Brandt Federal Republic of Jerman "Chancellor of the Federal Republic of Jerman; for West Jerman's Ostpolitik"
1973 Henry A. Kissinger Amérika Sarékat "For the 1973 Paris agreement intended to bring about a cease-fire in the Vietnam war and a withdrawal of the American forces"
1974 Seán MacBride Ireland "President of the International Peace Bureau; President of the Commission of Namibia." "For his strong interest in human rights: piloting the European Convention on Human Rights through the Council of Europe, helping found and then lead Amnesty International and serving as secretary-general of the International Commission of Jurists"
Eisaku Sato Japan "Prime Minister of Japan," "for his renunciation of the nuclear option for Japan and his efforts to further regional reconciliation"
1978 Mohamed Anwar Al-Sadat Mesir "for the Camp David Agreement, which brought about a negotiated peace between Mesir and Israèl"
1979 Mother Teresa India "Leader of Missionaries of Charity"
1980 Adolfo Pérez Esquivel Argentina "Human rights leader;" "founded non-violent human rights organizations to fight the military junta that was ruling his country (Argentina)." 1983 Lech Wałęsa Poland "Founder of Solidarność; campaigner for human rights"
1984 Desmond Mpilo Tutu South Africa "Bishop of Johannesburg; former Secretary General, South African Council of Churches"
1986 Elie Wiesel Amérika Sarékat "Chairman of "The President's Commission on the Holocaust""
1987 Óscar Arias Sánchez Costa Rica "for his work for peace in Central America, efforts which led to the accord signed in Guatemala on August 7 this year"
1989 The 14th Dalai Lama (Tenzin Gyatso) Tibet "[for] his struggle for the liberation of Tibet [and] consistently has opposed the use of violence. He has instead advocated peaceful solutions based upon tolerance and mutual respect in order to preserve the historical and cultural heritage of his people." 1990 Mikhail Sergeyevich Gorbachev USSR President of the Soviet Union, "for his leading role in the peace process which today characterizes important parts of the international community"
1991 Aung San Suu Kyi Burma "for her non-violent struggle for democracy and human rights"
1992 Rigoberta Menchú Tum Guatemala "[for] her work for social justice and ethno-cultural reconciliation based on respect for the rights of indigenous peoples"
1994 Yasser Arafat Palestine "for their efforts to create peace in the Middle East"
1997 International Campaign to Ban Landmines Amérika Sarékat "for their work for the banning and clearing of anti-personnel mines"
1998 John Hume Ireland "for their efforts to find a peaceful solution to the conflict in Northern Ireland"
1999 Médecins Sans Frontières Swiss "in recognition of the organization's pioneering humanitarian work on several continents"
2000 Kim Dae Jung South Koréa "for his work for democracy and human rights in South Koréa and in East Asia in general, and for peace and reconciliation with North Koréa in particular"
2002 Jimmy Carter Amérika Sarékat "for his decades of untiring effort to find peaceful solutions to international conflicts, to advance democracy and human rights, and to promote economic and social development"
2007 Al Gore Amérika Sarékat "for their efforts to build up and disseminate greater knowledge about man-made climate change, and to lay the foundations for the measures that are needed to counteract such change"
2008 Martti Ahtisaari Finlandia "for his important efforts, on several continents and over more than three decades, to resolve international conflicts"
2010 Liu Xiaobo China "for his long and non-violent struggle for fundamental human rights in China"
2015 Tunisian National Dialogue Quartet Tunisia "for its decisive contribution to the building of a pluralistic democracy in Tunisia in the wake of the Jasmine Revolution of 2011"
2016 Juan Manuel Santos Colombia "for his resolute efforts to bring the country's more than 50-year-long civil war to an end, a war that has cost the lives of at least 220,000 Colombians and displaced close to six million people"
"All Nobel Peace Prize Laureates". Nobel Foundation. Dijupuk 2008-11-29. "Nobel Prize winners by category (peace)". Encyclopædia Britannica. Dijupuk 2008-11-29. ↑ "Excerpt from the Will of Alfred Nobel". Nobel Foundation. Dijupuk 2008-12-03. ↑ a b c d e f g h i j k l m n Lundestad, Geir (2001-03-15). "The Nobel Peace Prize, 1901–2000". Nobel Foundation. Dijupuk 2008-11-28. ↑ a b "The Nobel Peace Prize 1901". Nobel Foundation. Dijupuk 2008-10-20. ↑ a b "The Nobel Peace Prize 1902". Nobel Foundation. Dijupuk 2008-11-12. ↑ "The Nobel Peace Prize 1903". Nobel Foundation. Dijupuk 2008-11-12. ↑ "The Nobel Peace Prize 1904". Nobel Foundation. Dijupuk 2008-11-12. ↑ "The Nobel Peace Prize 1905". Nobel Foundation. Dijupuk 2008-11-12. ↑ "The Nobel Peace Prize 1906". Nobel Foundation. Dijupuk 2008-11-12. ↑ a b "The Nobel Peace Prize 1907". Nobel Foundation. Dijupuk 2008-11-12. ↑ a b "Peace Prize is divided; Teodoro Moneta of Italy and Louis Renault of Prancis Share It". The New York Times. 1907-12-11. Dijupuk 2009-01-25. ↑ a b "The Nobel Peace Prize 1908". Nobel Foundation. Dijupuk 2008-11-12. ↑ a b "The Nobel Peace Prize 1909". Nobel Foundation. Dijupuk 2008-11-12. ↑ "The Nobel Peace Prize 1910". Nobel Foundation. Dijupuk 2008-11-12. ↑ a b "The Nobel Peace Prize 1911". Nobel Foundation. Dijupuk 2008-11-12. ↑ "The Nobel Peace Prize 1912". Nobel Foundation. Dijupuk 2008-11-12. ↑ "The Nobel Peace Prize 1913". Nobel Foundation. Dijupuk 2008-11-12. ↑ "The Nobel Peace Prize 1917". Nobel Foundation. Dijupuk 2008-11-12. ↑ "The Nobel Peace Prize 1919". Nobel Foundation. Dijupuk 2008-11-12. ↑ "The Nobel Peace Prize 1920". Nobel Foundation. Dijupuk 2008-11-12. ↑ a b "The Nobel Peace Prize 1921". Nobel Foundation. Dijupuk 2008-11-12. ↑ "The Nobel Peace Prize 1922". Nobel Foundation. Dijupuk 2008-11-12. ↑ a b "The Nobel Peace Prize 1925". Nobel Foundation. Dijupuk 2008-11-12. ↑ a b "The Nobel Peace Prize 1920". Nobel Foundation. Dijupuk 2008-11-12. ↑ a b "The Nobel Peace Prize 1927". Nobel Foundation. Dijupuk 2008-11-12. ↑ "The Nobel Peace Prize 1929". Nobel Foundation. Dijupuk 2008-11-12. ↑ "The Nobel Peace Prize 1930". Nobel Foundation. Dijupuk 2008-11-12. ↑ a b "The Nobel Peace Prize 1931". Nobel Foundation. Dijupuk 2008-11-12. ↑ "The Nobel Peace Prize 1933". Nobel Foundation. Dijupuk 2008-11-12. ↑ "The Nobel Peace Prize 1934". Nobel Foundation. Dijupuk 2008-11-12. ↑ "The Nobel Peace Prize 1935". Nobel Foundation. Dijupuk 2008-11-12. ↑ "The Nobel Peace Prize 1936". Nobel Foundation. Dijupuk 2008-11-12. ↑ "The Nobel Peace Prize 1937". Nobel Foundation. Dijupuk 2008-11-12. ↑ "The Nobel Peace Prize 1938". Nobel Foundation. Dijupuk 2008-11-12. ↑ "The Nobel Peace Prize 1944". Nobel Foundation. Dijupuk 2008-11-12. ↑ "The Nobel Peace Prize 1945". Nobel Foundation. Dijupuk 2008-11-12. ↑ a b "The Nobel Peace Prize 1946". Nobel Foundation. Dijupuk 2008-11-12. ↑ "The Nobel Peace Prize 1947". Nobel Foundation. Dijupuk 2008-11-12. ↑ "The Nobel Peace Prize 1949". Nobel Foundation. Dijupuk 2008-11-12. ↑ "The Nobel Peace Prize 1950". Nobel Foundation. Dijupuk 2008-11-12. ↑ "The Nobel Peace Prize 1951". Nobel Foundation. Dijupuk 2008-11-12. ↑ "The Nobel Peace Prize 1952". Nobel Foundation. Dijupuk 2008-11-12. ↑ "The Nobel Peace Prize 1953". Nobel Foundation. Dijupuk 2008-11-12. ↑ "The Nobel Peace Prize 1954". Nobel Foundation. Dijupuk 2008-11-12. ↑ "The Nobel Peace Prize 1957". Nobel Foundation. Dijupuk 2008-11-12. ↑ "The Nobel Peace Prize 1958". Nobel Foundation. Dijupuk 2008-11-12. ↑ "The Nobel Peace Prize 1959". Nobel Foundation. Dijupuk 2008-11-12. ↑ "The Nobel Peace Prize 1960". Nobel Foundation. Dijupuk 2008-11-12. ↑ "The Nobel Peace Prize 1961". Nobel Foundation. Dijupuk 2008-11-12. ↑ "The Nobel Peace Prize 1962". Nobel Foundation. Dijupuk 2008-11-12. ↑ "The Nobel Peace Prize 1963". Nobel Foundation. Dijupuk 2008-11-12. ↑ "The Nobel Peace Prize 1964". Nobel Foundation. Dijupuk 2008-11-12. ↑ "The Nobel Peace Prize 1965". Nobel Foundation. Dijupuk 2008-11-12. ↑ "The Nobel Peace Prize 1968". Nobel Foundation. Dijupuk 2008-11-12. ↑ "The Nobel Peace Prize 1969". Nobel Foundation. Dijupuk 2008-11-12. ↑ "The Nobel Peace Prize 1970". Nobel Foundation. Dijupuk 2008-11-12. ↑ "The Nobel Peace Prize 1971". Nobel Foundation. Dijupuk 2008-11-12. ↑ "The Nobel Peace Prize 1973". Nobel Foundation. Dijupuk 2008-11-12. ↑ a b "The Nobel Peace Prize 1974". Nobel Foundation. Dijupuk 2008-11-12. ↑ "The Nobel Peace Prize 1975". Nobel Foundation. Dijupuk 2008-11-12. ↑ "The Nobel Peace Prize 1975–Presentation Speech". Nobel Foundation. Dijupuk 2008-12-03. ↑ "The Nobel Peace Prize 1976". Nobel Foundation. Dijupuk 2008-11-12. ↑ "The Nobel Peace Prize 1977". Nobel Foundation. Dijupuk 2008-11-12. ↑ "The Nobel Peace Prize 1978". Nobel Foundation. Dijupuk 2008-11-12. ↑ "The Nobel Peace Prize 1979". Nobel Foundation. Dijupuk 2008-11-12. ↑ "The Nobel Peace Prize 1980". Nobel Foundation. Dijupuk 2008-11-12. ↑ "The Nobel Peace Prize 1981". Nobel Foundation. Dijupuk 2008-11-12. ↑ "The Nobel Peace Prize 1982". Nobel Foundation. Dijupuk 2008-11-12. ↑ "The Nobel Peace Prize 1982–Presentation Speech". Nobel Foundation. Dijupuk 2008-12-03. ↑ "The Nobel Peace Prize 1983". Nobel Foundation. Dijupuk 2008-11-12. ↑ "The Nobel Peace Prize 1984". Nobel Foundation. Dijupuk 2008-11-12. ↑ "The Nobel Peace Prize 1985". Nobel Foundation. Dijupuk 2008-11-12. ↑ "The Nobel Peace Prize 1986". Nobel Foundation. Dijupuk 2008-11-12. ↑ "The Nobel Peace Prize 1987". Nobel Foundation. Dijupuk 2008-10-20. ↑ "The Nobel Peace Prize 1988". Nobel Foundation. Dijupuk 2008-11-12. ↑ "The Nobel Peace Prize 1988–Press release". Nobel Foundation. 1988-09-29. Dijupuk 2008-11-28. ↑ "The Nobel Peace Prize 1989". Nobel Foundation. Dijupuk 2008-11-12. ↑ "The Nobel Peace Prize 1989–Press release". Nobel Foundation. 1989-10-05. Dijupuk 2008-11-28. ↑ "The Nobel Peace Prize 1990". Nobel Foundation. Dijupuk 2008-10-20. ↑ "The Nobel Peace Prize 1991". Nobel Foundation. Dijupuk 2008-10-20. ↑ "The Nobel Peace Prize 1992". Nobel Foundation. Dijupuk 2008-10-20. ↑ "The Nobel Peace Prize 1993". Nobel Foundation. Dijupuk 2008-10-20. ↑ "The Nobel Peace Prize 1994". Nobel Foundation. Dijupuk 2008-10-20. ↑ "The Nobel Peace Prize 1995". Nobel Foundation. Dijupuk 2008-10-20. ↑ "The Nobel Peace Prize 1996". Nobel Foundation. Dijupuk 2008-10-20. ↑ "The Nobel Peace Prize 1997". Nobel Foundation. Dijupuk 2008-10-20. ↑ "The Nobel Peace Prize 1998". Nobel Foundation. Dijupuk 2008-10-20. ↑ "The Nobel Peace Prize 1999". Nobel Foundation. Dijupuk 2008-10-20. ↑ "The Nobel Peace Prize 2000". Nobel Foundation. Dijupuk 2008-10-20. ↑ "The Nobel Peace Prize 2001". Nobel Foundation. Dijupuk 2008-10-20. ↑ "The Nobel Peace Prize 2002". Nobel Foundation. Dijupuk 2008-10-20. ↑ "The Nobel Peace Prize 2003". Nobel Foundation. Dijupuk 2008-10-20. ↑ "The Nobel Peace Prize 2004". Nobel Foundation. Dijupuk 2008-10-20. ↑ "The Nobel Peace Prize 2005". Nobel Foundation. Dijupuk 2008-10-20. ↑ "The Nobel Peace Prize 2006". Nobel Foundation. Dijupuk 2008-10-20. ↑ "The Nobel Peace Prize 2007". Nobel Foundation. Dijupuk 2008-10-20. ↑ "The Nobel Peace Prize 2008". Nobel Foundation. Dijupuk 2008-10-10. ↑ "The Nobel Peace Prize 2010". Nobel Foundation. Diarsip saka sing asli ing 2011-12-02. Dijupuk 2010-10-08. ↑ "The Nobel Peace Prize 2011". Nobel Foundation. Dijupuk 2011-10-07. ↑ "The Nobel Peace Prize 2012". Nobel Foundation. Dijupuk 12 October 2012. ↑ "The Nobel Peace Prize 2013" (PDF). Nobel Foundation. Diarsip saka sing asli (PDF) ing 2013-10-11. Dijupuk 2013-10-11. ↑ "The Nobel Peace Prize 2014". Nobel Foundation. Dijupuk 2014-10-10. ↑ "The Nobel Peace Prize 2015". Nobel Foundation. Dijupuk 2015-10-09. ↑ "The Nobel Peace Prize 2016". Nobel Foundation. Dijupuk 2016-10-07. ↑ "The Nobel Peace Prize 2017 - Press Release". www.nobelprize.org. Dijupuk 2017-10-06. Wikimedia Commons duwé médhia ngenani Nobel Peace Prize laureates. Kaca iki pungkasan diowah nalika 06.53, 20 April 2019.